When it comes to a cure for economic collapse, austerity is currently the conventional wisdom. But history has shown austerity to be "an entirely perverse remedy," says economist Robert Kuttner, 2012 Wayne Morse chair in residence at the University of Oregon's Wayne Morse Center for Law and Politics. 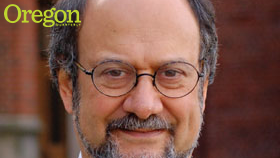 Kuttner is cofounder and coeditor of The American Prospect Magazine, a columnist for the Boston Globe, and the author of 10 books on the U.S. economic system and the politics of markets, including Debtor's Prison: The Politics of Austerity vs. Possibility, which comes out in May. At the UO this fall, he delivered a series of lectures titled Untangling the Economy. The following is adapted from the first of those lectures, "The Political Economy of Austerity," in which Kuttner evoked America's post–World War II economic boom as an example of fiscal policy that successfully curtailed recession, and warned of the "dismal politics" hindering economic recovery today. I titled this lecture "The Political Economy of Austerity" because everything about our response to the current economic collapse is political: Who benefits and who suffers, the adoption of this policy or that one, drastic reform or bailouts, how the crisis is used ideologically. Throughout, austerity—the reduction of the federal budget deficit—is the conventional wisdom. Yet, there is no plausible theory of economics to explain how a depressed economy can deflate to recovery. To understand why, let's recall what caused the collapse. It wasn't excess public spending, large public debts, or the worry that interest rates would rise in 2023 because of the Social Security deficit. Two kinds of private debt crashed the economy. The first was short-term debt incurred by banks to finance speculative debts, sometimes in ratios as high as 50 to 1. That means they borrowed $50 for every dollar they had of their own capital. When the speculative debts went bad, the house of cards collapsed. That was the prime cause of the crash, which fed a downward spiral of lost jobs and dwindling government revenue. It worsened a 30-year trend in which the majority of American workers' wages lagged behind productivity growth—by 2011, according to the Census Bureau, median household income had fallen back to the 1990 level. The second kind of debt was that incurred by households to make up for this shortfall in income. Since the late 1970s, median incomes have lagged behind inflation, while costs, especially of housing, have exceeded it. Why? Throughout that period, interest rates kept falling. If you were trying to buy a $300,000 house at 8 percent interest, and the mortgage interest rate dropped to 4 percent, suddenly you could afford a $600,000 house! But even though productivity doubled during that period, wages increased only about 11 percent—incomes were insufficient to support this increased purchasing power, and people gradually substituted debt for income. Banks made it easy to borrow; they came up with all kinds of devices for people to take out second and third mortgages. But if borrowing by households is propping up the economy and the housing bubble bursts, the whole thing collapses. Borrowing to sustain consumption is not sustainable. The New York Times has branded this economic crisis the Great Recession, but it is not a very apt description. A better term would be the Lesser Depression, because the dynamics are similar to those of the Great Depression, although not as catastrophic. Both follow a pattern the economist Irving Fisher described in his 1933 classic "The Debt-Deflation Theory of Great Depressions." Debt deflation works like this: If a crash in asset prices—in this case houses—causes private debts to exceed the market value of their collateral, then people lose homes, banks suffer losses on mortgages as houses are unloaded, and the entire economy goes into a tailspin. Falling wages add to the collapse, creating prolonged, self-reinforcing deflation in economic activity. Depressions, as opposed to recessions, are invariably the result of financial collapses. Consumers and businesses overwhelmed with debt face a choice. They can curtail spending to keep current on debt, or they can default on the debt and lose the collateral, further reducing prevailing prices. Either way, their actions worsen the general deflation. The Great Depression was a massive debt deflation. The current one is somewhat confined to the housing sector, but had the Federal Reserve not intervened with very low interest rates and massive aid to banks, this could have gone the way of the 1930s. Housing is the single largest asset of American households. The crash wiped out $9 trillion worth of home equity. That makes you feel poorer. The austerity lobby ignores all of this, however, and blames the crisis on deficits and the debt-to-GDP ratio that businesses are supposedly worrying about before they decide to invest. Just imagine a group of business leaders having dinner and saying, "I'm thinking of expanding, but I'm not sure what the debt-to-GDP ratio will be in 2023." Anybody who thinks this is entirely delusional. Yet, in 2008, a financial mogul by the name of Peter G. Peterson set up a foundation with a billion dollars of his own money to lobby for austerity. It is a mark of the influence of this elite lobbying group that President Obama, at the very moment his stimulus program was making a little bit of a difference (although it was clearly inadequate to produce real recovery), became a convert to austerity. In 2010, Obama created the National Commission on Fiscal Responsibility and Reform—the Bowles-Simpson Commission. With this decision, the president painted himself into a corner where he had to take seriously the recommendations of an austerity commission of his own creation, recommendations that would lead to a premature fiscal contraction of a still rather fragile economy. But there are economists who know what to do, who are proposing a much better set of policies. History's great example is World War II, the greatest unintended economic recovery program ever known. In the decade preceding the war, the deficit was low, between 4 and 6 percent of GDP, and the growth rate was terrific. Even so, unemployment remained about 14 percent on the eve of World War II. Then came Pearl Harbor, and the government entered about $100 billion of war-production orders in six months. Unemployment melted away to 2 percent. Industry was recapitalized, workers were retrained and reemployed, and civilian living standards increased because people had decent jobs again. Even though half of the stuff we made was produced only to be blown up, GDP increased by 50 percent over four years. Most of the cost of the war was borrowed, however. By the end of World War II, the debt-to-GDP ratio was 120 percent. That's substantially more than the 2012 ratio of about 72 percent. So, what did the statesmen and -women of 1945 do? Did they appoint an expert commission to target a reduced debt ratio in 1955? No. They worried that without the stimulus of war we would sink right back into the Great Depression. They worried about how we would reemploy 12 million returning GIs and the civilians who lost their jobs when the war-production effort ended. So instead of saying, "My God! We have to cut the deficit!" they enacted policy to increase the growth rate. People spent war bonds on down payments on homes, and there was a rocky year, but there was an almost seamless transition from the stimulus of the war to the stimulus of the postwar boom, because the economy after the war grew at a higher rate than the debt. By the late 1970s the debt ratio was down from 120 percent to about 27 percent, before the Reagan-era tax cuts sent it rising again. Today's economy needs the stimulus of massive public investment that war-production spending provided in the 1930s, but without the war. The American Society of Civil Engineers estimates that we have a $2.4 trillion shortfall in deferred maintenance on roads, bridges, water, and sewer systems. On top of that we need a new, 21st-century infrastructure: a smart electric grid, green buildings, universal broadband. This could be financed by borrowing—interest rates are lower than ever; take advantage of them. But you can't talk about this today in mainstream politics, and this is the real tragedy for our era. Large-scale public investment of the sort that supported the post–World War II boom is simply off the table. Instead, Democrats and Republicans are debating whether the debt reduction should be $4 trillion or $5 trillion; whether we should reduce it by tax increases, or by program cuts. Look at Europe—every country that has suffered the effects of severe austerity programs has gone deeper into depression. I think the economics of what to do are clear, but the politics are muddled. Will politics allow us to get where we need to, or will we spend the next several years mired in first gear? After his election victory, Obama took a small but significant step in the right direction when he insisted that the budget deal with Congress to avoid the first so-called fiscal cliff include tax increases on the wealthiest but no spending cuts. However, in future budget negotiations, the president will face intense pressure to cut spending and reduce the deficit. Obama should be clear that the recovery is too weak to cut spending. If anything, we need more public spending to make up for the shortfall in private demand. Once growth returns, the deficit ratio will decline, as it did after World War II. This is a pivotal moment in our national history. We have no choice but to keep struggling for sensible policies to save our economy and save our republic.